The New York Yankees are now exactly two weeks from the start of the regular season and the name of the game is fine tuning. Plain and simple, this is the time to work out the final kinks for pitchers and for the hitters to nail down their timing. It's going to get real very soon. CC Sabathia stepped on the hill Sunday for his second start of the spring and while it was encouraging to see he had the same life on his fastball as his first start, he certainly needs more time to work on his command. Sabathia's fastball has been sitting the low 90s consistently and reached 94-mph Sunday which is a great sign. However, he allowed three home runs along the way so while the uptick makes his offspeed deliveries harder to distinguish, he cannot afford to leave the fastball in the zone. Sabathia said he feels much better than he did last year at this time and manager Joe Girardi is pleased with the added velocity and notes there is time in camp to get sharper. "For him it's just getting back to the consistency and getting him some work," Girardi said according to Jamal Collier of MLB.com. "He feels great, there's a lot of life to his arm, so I'm still encouraged. I don't worry about the numbers, I'm not going to because I think he needs to pitch; he's not pitched a lot in the last 20 months or whatever. So we've got to get him out there." For a different unbiased look, New York Mets third baseman David Wright was more than complimentary to Sabathia. "He looked sharp, crisp," Mets third baseman David Wright said. "Stuff-wise, he looked like the CC I remember when he was excellent." Understanding Wright is a class act and won't be negative about players on other teams; his comments should carry some weight. 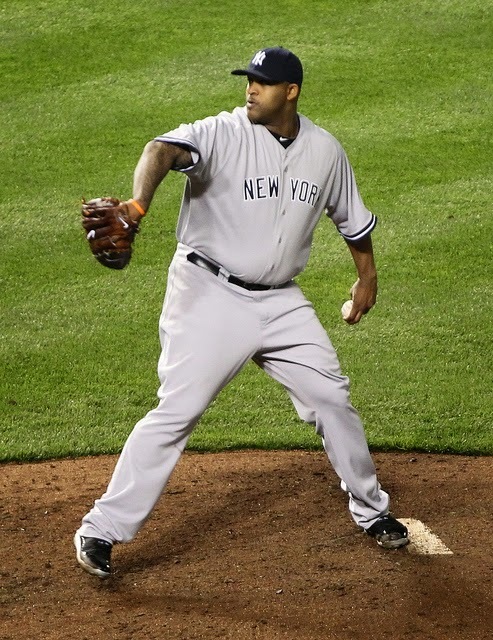 He could have simply said Sabathia looked good. Esmil Rogers allowed his first runs of the spring Thursday, going 3.1 innings and giving up three runs on five hits. His main competitor Adam Warren was strong in five innings of one-run ball the following day. Chase Whitley tossed three scoreless innings after Warren and the final contender Bryan Mitchell starts Monday’s game. It remains to be seen if this will be Mitchell’s last start or not as time winds down in camp. As for Whitley, since he is coming into games after the starter, it seems his role would be as a swingman if he makes the club. As it stands now, Rogers and Warren will get two or three more starts, and it is likely the winner of the fifth starter role is one of those two with the other moving to the bullpen. From the beginning, we’ve liked Warren in this role (regardless of Chris Capuano’s health) and have yet to figure out why the Yankees remain high on Rogers. Jose Pirela has the potential to be a super-utility player for the Yankees; however, it will probably not happen at the break of camp after the 25-year-old prospect slammed into the center field wall in Sunday’s game, causing a concussion. Results of subsequent tests were normal, so Pirela will be on the shelf for at least a week to 10 days. Pirela was hitting .370 (10-for-27) with five extra-base hits this spring and doing his best to supplant Brendan Ryan for the infield utility role. It seemed in recent days that the Yankees were looking for ways to keep Pirela involved and see exactly how much of an asset he could be off the bench, thus his playing center field Sunday. It was argued here last week that Pirela was being robbed of a roster spot. Unfortunately, for the time being, the argument is moot. Just as the pitchers will use the final two weeks of Spring Training to fine tune their mechanics, the Yankees offense will search for the missing pieces to their swings. Of the expected crop of position players set to make the 25-man roster only three players are hitting above .250, with only Chase Headley hitting above .300 (.316, 10-for-32 with two home runs). As good as the pitching has been thus far, the staff cannot be expected to hold opponents to two runs or less all the time. Sure, this is a veteran club and maybe the last two weeks of spring will be different, but it would sure be nice to see some life in a few of the bats, especially guys like Mark Teixeira and Carlos Beltran who are key components to the offense. Given each of their struggles last season, it’s tough to dismiss their early season results. No closer until regular season begins? According to Chad Jennings of the LoHud Yankees Blog, the club might not have a set closer once the regular season begins. This is an interesting development as many assumed that Dellin Betances would have placed himself at the top rung by now. But, Betances has not been very sharp thus far and his fastball velocity is slightly diminished from last season. On the other hand, Andrew Miller has been crisper and is certainly qualified to close out games. We’ve discussed several times the good fortune of having two players who can close at Girardi’s disposal. Maybe Girardi wants to test the waters some in regular season games before settling on one player, or he intends on taking this day by day and making his decisions based on the opposition’s batting order in late innings.